Are you missing out? The UK Gay Hotel & Travel Guide and The Gay Britain Network are visited by 1000's of gay men and lesbians from all over the world every month. Click here to advertise. 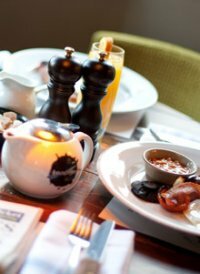 Hotel Indigo London-Paddington is one of the finest boutique hotels in London near Paddington station. Stay in style with chic elegant hotel Indigo London. Hotel Indigo Paddington is a four-star boutique hotel located close to Paddington Station in London. An oasis of luxury and tranquility, the hotel offers business and leisure travellers a modern, elegantly appointed base from which they can explore all that London has to offer. The hotel features exclusive accommodation and outstanding facilities including a fitness centre and the London Street Brasserie restaurant and bar which offers seasonal dishes and a patio dining experience. With high quality decor, warm, friendly service, and thoughtful touches including complimentary wi-fi, Hotel Indigo Paddington is your London hotel of choice, for both business and pleasure. 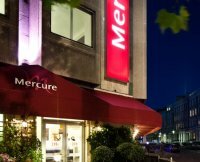 Mercure London Kensington Hotel is a four star hotel situated in fashionable Kensington minutes from Knightsbridge and Earls Court. It is ideally situated for Earls Court Exhibition Centre and Olympia as well as exporing the West End. The property has recently been refurbished to a high standard and offers Wifi and air conditioning throughout. Executive rooms also offer bathrobes, slippers and complimentary soft drinks. Mercure London Paddington Hotel is a four star property franchised with Accor Hotels and situated adjacent to Paddington Station and the Heathrow Express connection. The property has 82 bedrooms, 3 meeting rooms for up to 12 people, a bar and on site Garfunkel's restaurant. All rooms are fully air conditioned and Wifi is available throughout the building. Executive rooms also offer bathrobes, slippers and complimentary soft drinks. 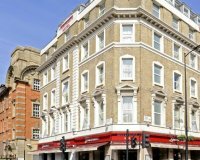 Quality Crown Hotel Hyde Park is franchised with Choice Hotels and is a four star property comprising of 4 townhouse buildings enviably located on a garden square moments from both Paddington Station and Hyde Park. The hotel offers Wifi throughout, feature quad bed and four poster bedrooms, and has a vibrant hotel bar. 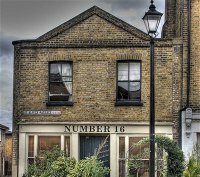 Description: Bed and breakfast offered at 16 St Alfege in an unusual, interior designed property in central Greenwich, close to all amenities and transport links. 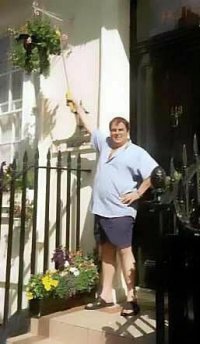 113 Ebury Street, Belgravia, London, SW1W 9QU. Description: Located in Belgravia between Victoria rail and coach stations.We are a gay friendly B&B ideally situated for the West End (Soho is a 25 minute walk), Londons famous shopping areas and many of it's famous landmarks. 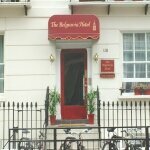 Are you looking for a small, clean and friendly hotel or bed and breakfast in central London? If so then the Lynton Hotel is strongly recommended. 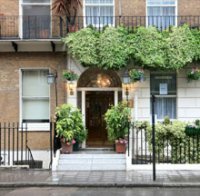 A friendly, family owned bed and breakfast run by Mark and Simon, two London born brothers who genuinely care about the happiness of their guests. If you would like to know more about the Lynton Hotel then please feel free to browse our website or alternatively click on the link below to contact us. Nearest tube: Victoria. "Gay friendly". Contact Mark or Simon. A very centrally located affordable and comfortable bed & breakfast hotel in Victoria, 2 mins from coach station. Newly refurbished throughout. Free 24 hr internet access, shared dormitories from �25pppn. Discounts for advance, group and online bookings. Description: The Lincoln House Hotel is owned and operated by Joseph Sheriff who is a seasoned traveller himself, well acquainted with international travellers' needs and expectations, with an experience stretching over thirty years. The Lincoln House is recommended by many reputable guidebooks such as Time Out, Rough Guide, Baedeckers and many others. 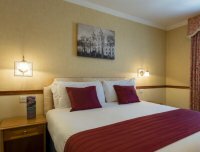 The hotel is delightfully hospitable, gay-friendly establishment which offers a warm, relaxed and welcoming atmosphere. 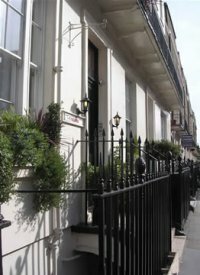 Uniquely close to the hub of London's diverse lesbian and gay scene activities. Built in the late 18th century, in the reign of King George III, the hotel is recently refurbished and tastefully decorated to offer en-suite rooms with modern comforts, while retaining its elegant Georgian townhouse character alongside a nautical theme d�cor, to give a ship's cabin feel. You get a lot of valuable insider-tips on such things as cheap theatre tickets, nightclubs, discos and on other places of interest. We offer free luggage storage facilities, safety boxes, mini fridge in the room for private use and Internet access to your laptop in the lounge. Limited parking spaces are also available at 50% of the normal London parking rates. We now offer Vegetarian and Mediterranean Breakfast We offer Free Internet access to all guests and all our rooms have free wireless Internet access. For our special offers of up to 30% discount and further information on our hotel, please visit our website or call us on +44 (0) 20 7486 7630. Description: Gay friendly hotel in central London offering cheap, affordable quality without all the fuss and bother. Inexpensive accommodation in London would seem to be very thin on the ground. That's why, if you're after inexpensive central London hotels, you need look no further than here! We pride ourselves on our attention to detail and ensuring your trip is as enjoyable as possible. Our philosophy is to provide cheap and inexpensive accommodation in London without compromising on quality. 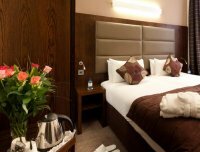 So if you're after a London England hotel on a budget take a look around The Oxford Hotel and contact us for availability. If you are travelling to London and are unsure about what to do, where to stay, there are a number of agencies who offer services from booking hotels for you, arranging tickets for theatre shows and where the best clubs and bars are. It is worth considering some of the following. If calling from North America dial 0 11 44 and lose the 0 from in front of the number. If calling from Europe dial 00 44 and drop the 0 from in front of the number.